Credits written by Andy Haywood. Published in Trident, issue 96, Winter 2005, The Maserati Club. We had been driving all morning at motorway speeds when it happened. An elderly Maser can still more than hold its own with modern traffic and in our attempt to 'do' four countries in one day on the way back from the Italian international, it seemed to be going according to schedule as we crossed from Germany to France somewhere around Strasbourg and once again accelerated to an 85 mph cruising speed. And then what seemed like only moments later, Cliff Clifton and I watched from the comfort of his 350GT as the Sebring in front slewed violently across the road when a rear tyre burst. There was no real drama as Roger's Rodeo days had obviously stood him in good stead as he brought the beast to heel on the hard shoulder, but it was, as they say, a heart stopper. Last year was a strange year for tyre failures. Maybe global warming is to blame, as it seems that hot weather highlights the weak points. Earlier in the summer, Scot Crane had suffered a rapidly shredding XWX on his Kyalami on the way to Stanford Hall and Norman Geddes a similar problem with his Indy on the return journey. Granted that the Epsztajn tyre was already the spare and also not a high quality variant, but these tyres all had two things in common. They had plenty of tread on them, but they were very old. Most of us with classic cars, or even modern Masers which we cherish and do not use daily, have already accepted the fact that mechanical maintenance is required on a time basis as much as by mileage. Yet we still underestimate the ravages of the time on our tyres. 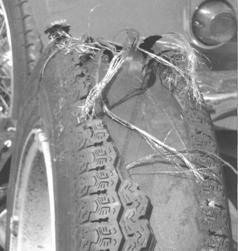 I remember that only a few years ago, a major high street supplier of tyres in the UK was taken to court for supplying tyres that were past their sell by date, and yet many of us are happy enough to drive high performance cars in the spirit of their creation but with ancient tyres that are frankly dangerous. And at the end of the day, our old tyres are doing the handling no favours either. So if you want to enjoy your Maserati in the way it was meant to be enjoyed, you should keep your tyres up to date. Except that sometimes it is not that easy to get the correct replacements. For the very reason that tyres have a shelf life, supply is very much tailored to demand and when demand falls, certain types, sizes and speed ratings become no longer available. And sometimes the alternatives are not obvious. I have long felt that an article on the subject would be of benefit to the membership and now, with the help of a new advertiser, Longstone Tyres, we can talk you through the complicated subject of rubber. For this issue, we will deal with the straight six cars and their sixteen inch wheels. Original fitment on an early 3500GT would have been a PIRELLI crossply, but around 1960 PIRELLI brought out their first high performance radial, the CINTURATO ™, which was ideally suited to the Maseratis and became standard equipment on later versions. The size was 185VR16. In those days there was no aspect ratio and also no choice of width. After all, 185 was considered shockingly wide in 1960! This tyre continued in normal production until sometime in the 1970s but eventually dropped off the list. PIRELLI then manufactured an SR version of the same tyre (presumably cheaper to make), which was stamped 'for vintage car use only'. However, some years ago, even that became obsolete. The competition for the CINTURATO ™, was slim. Michelin produced their Michelin Radial X in the 185 size (but not VR rated) and for a while Firestone produced a tyre called the Cavallino in HR but realistically, the only reason for using either of the latter was price. "I replaced the ageing and probably by then very wooden Dunlops on my Sebring 1 with Avon Turbosteel. I was almost disappointed by just how enormous a change they made. Turn in is crisper, wet and dry grip much better, good under braking and generally more controllable. My only unreasonable grumble was that they screech less on the corners than before. I also now tend to run them a couple of pounds more pressure than recommended. To my mind this further improves their turn-in and make everything feel even more predictable. My one caveat is that I have experienced a blister on the side wall of a rear tyre after a protracted high speed run (more than 2 hours at more than l00mph). I no longer ignore the importance of the choice and newness of classic car tyres, nor the need to check them regularly." The CINTURATO ™ is periodically available (only in VR form) and is the only choice for the purist - 'its what the car was designed for' etc, and it is certainly the most authentic looking for the Concours contender. It is also still a respectable performer in the dry but its hard compound is surprisingly unforgiving in the wet. More expensive than the Avon. It is important to point out that since this article was written, the 185VR15 Pirelli Cinturato CA67 original Maserati tyre is being manufactured again by Pirelli using modern compounds. So although the carcass of these tyres will suit your car perfectly and handle the way the car should, the tread will provide more grip than it did in period and its wet performance will be the most dramatically improved. The Michelin X pattern was an icon on the Citroen 2CV and Light 15 It was designed in 1946 and was the first ever Radial tyre, but is not suited to the Maserati. The lack of suitable speed rating is not a particular problem, but the lack of 'on the limit' grip in wet or dry is. Also, they are excessively tall in the sidewall, which can foul wheel arches on some Maserati models. "I am a slow driver, believing speed breaks Maseratis and then they go to the great breaker in the sky (alias Bill McGrath or Eurospares). I am also a believer that while speed is a danger so is lack of use. Therefore my specification for tyres is simple - black, circular and capable of passing the M.O.T. oh! .... And preferably cheap and instantly available. My regular tyre supplier, Hi-Q, offered PIRELLI at vast prices, Michelins but with dubious availability and Vredesteins at £150 per corner (fitted and balanced), available in two days. On the basis of fitness for (my) purpose the Vredesteins were duly purchased. In use they have proved better than the 20 odd year old PIRELLIs in that the wheel shake that seemed to occur at all speeds when we drove through Italy (honestly that is why we were so slow, it doesn't however explain the navigational difficulties) has gone and now the old girl is a pleasure to drive. The Vignale isn't bad either. I am now saving up for two more for the rears and that may solve the problem of seemingly oval wheels that make even smooth roads bumpy. I'm sorry I can't comment on "on the limit handling" or other technical matters. But hey, you have Epsztajn for that, as Italy proved." Since this article was written Vredestein have dramatically increased the price of their tyres, making this once "good value for money alternative" more expensive than premium quality Pirelli or Michelin tyres. These brand new Michelins look for all the world like a period Englebert crossply with their block tread. However, they are a serious performance tyre being the only option that is actually W (168 mph) rated. Their wet weather performance is far in excess of anything else available but they are also expensive (free delivery on all orders taken for the Pilote X). 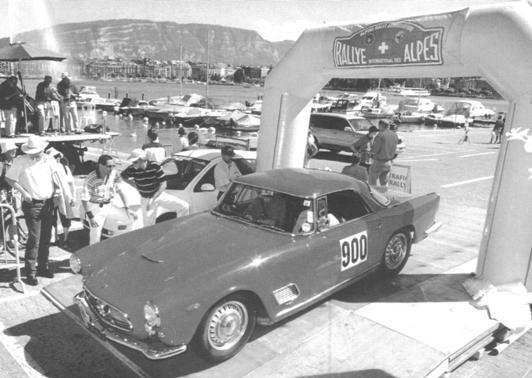 John Jackson's 3500GT is a familiar sight in these pages, mostly due to his sterling efforts on the Rallye Des Alpes. After last year's event, John felt that as the competition was hotting up, the Avon Turbosteels fitted to the 3500GT since its restoration ten years ago were no longer good enough, especially in the wet. After talking to Longstone tyres about the new Pilote X and to an AC Ace owner that had sampled them, John elected to make the change. The Rallye didn't go according to plan, although John was happy just to finish in the end as the attrition rate was very high due to appalling weather (only 57 finishers from 120 starters) and having had timing problems, the 3500GT came in 6th in class and 21st overall. All that bad weather did give the tyres a real test of course and John reported that they were in a word 'fantastic'. Dry and especially wet weather grip was far higher than with the Avons, allowing the 3500GT to press on competitively in all conditions.